Rubus ulmifolius is a highly invasive species that negatively affects biodiversity, especially on Robinson Crusoe Island (RCI), one of the two global mini-hotspots of vascular plants. 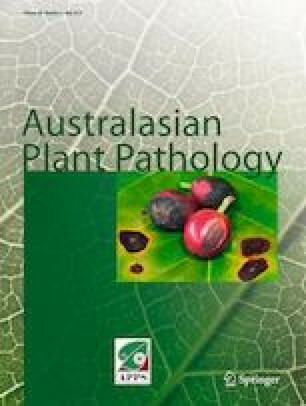 The rust Phragmidium violaceum has been used as a biological control agent for some Rubus species in mainland Chile, New Zealand and Australia. We aim to quantify P. violaceum pathogenicity over R. ulmifolius on RCI, under both field and laboratory conditions, to determine its potential as a biological control. In addition, in order to broaden our knowledge about the pathogenicity of P. violaceum from RCI, it was also tested on a highly susceptible Rubus species: R. cf. constrictus. We sampled four forest sites on RCI, measuring abiotic, micro-site, and vegetation variables that could be related with infection. In the laboratory, we inoculated P. violaceum into R. ulmifolius seedlings from RCI and R. cf. constrictus seedlings from mainland Chile. We found a low infection incidence in the field, where only 62 of 182 plots presented infected individuals. Applying a fitted generalized linear model, we predicted ten times more infection of P. violaceum on R. ulmifolius when located in southern aspect slopes and shallow soils (< 30 cm). In the laboratory we determined that rust from RCI infected R. ulmifolius individuals from the island in low density, and did not infect R. cf. constrictus; this low infection rate reinforces our field results. The low infection on R. cf. constrictus may mean that P. violaceum from RCI could originate from very impoverished genetic material. We recommend testing different rust genetic origins, mainly from the Old World, to increase their genetic diversity. We are grateful to I. Leiva, (Juan Fernandez National Park administrator 2004-2017) for help in collecting and sending samples to the mainland; to Ana Abarzúa (Universidad Austral de Chile) for collaborating with seedling collection, and Diego Pennekamp who contributed to the field methods. Additionally, we thank Marcia Barrientos and Carla Manríquez (Universidad de La Frontera) who collaborated with formatting matters. Our thanks to Dr. Michael Sohor for performing the ploidy analysis of seeds and to ElSharif Ramires for helping us with the pictures to confirm the identification of R. constrictus. We also acknowledge the collaboration of Susan Angus in the English edition of the manuscript. We especially thank the two anonymous reviewers who significantly improved this document. RVG thanks FONDECYT 11170987 and the Vicerrectoría de Investigación y Postgrado, Universidad de La Frontera (UFRO) for funding this study. CSR thanks the IEB (Instituto de Ecología y Biodiversidad-Chile) projects PF-23, 05-002 and CONICYT AFB 170008 for their financial support.